Colleen and I are on our way back to Minnesota, taking a non-direct route. 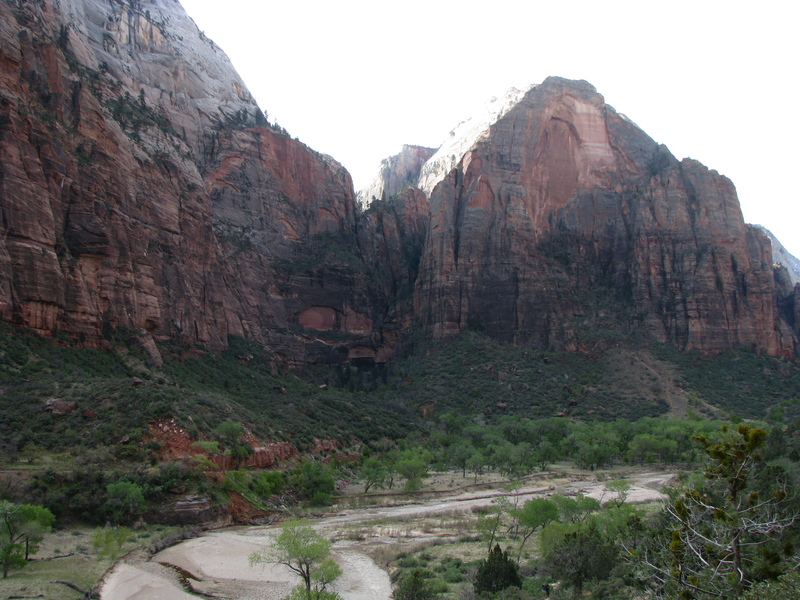 Right now we are in Zion National Park, in the southwest corner of Utah. 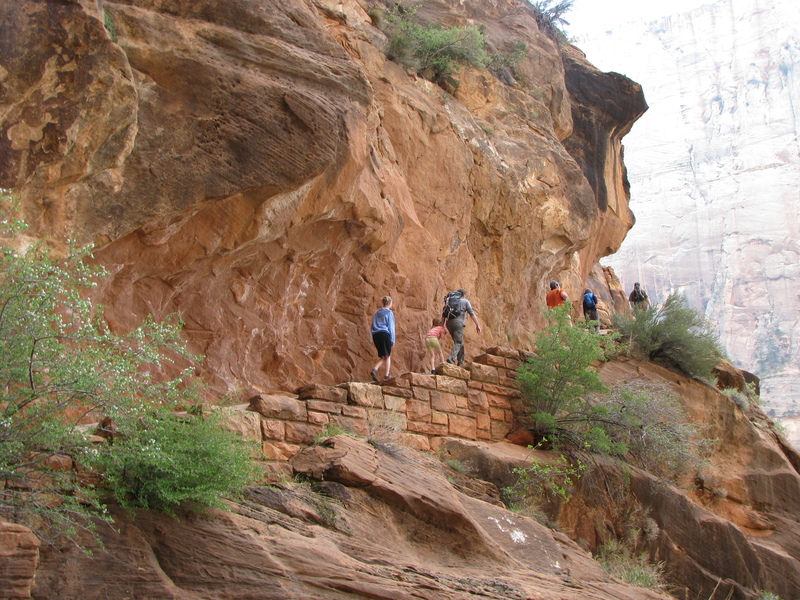 The park has a variety of hikes of various categories. 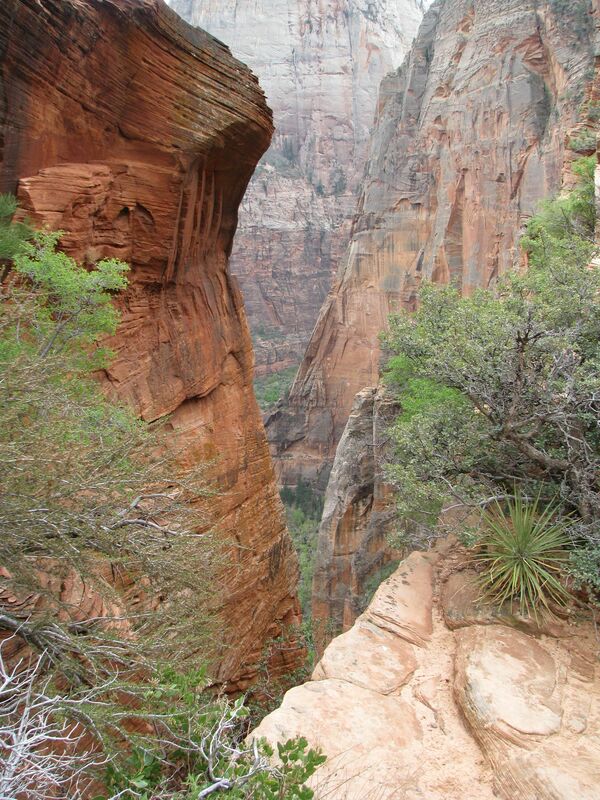 One of the most popular is a hike to a peak called “Angels Landing”. Today I tackled that route. 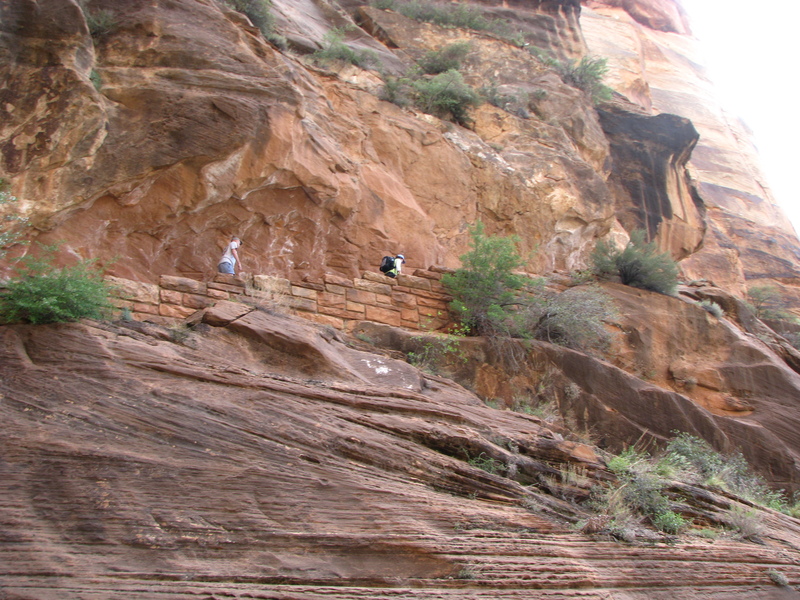 The destination for this hike is the top of the rock formation seen in the right of the photo above. 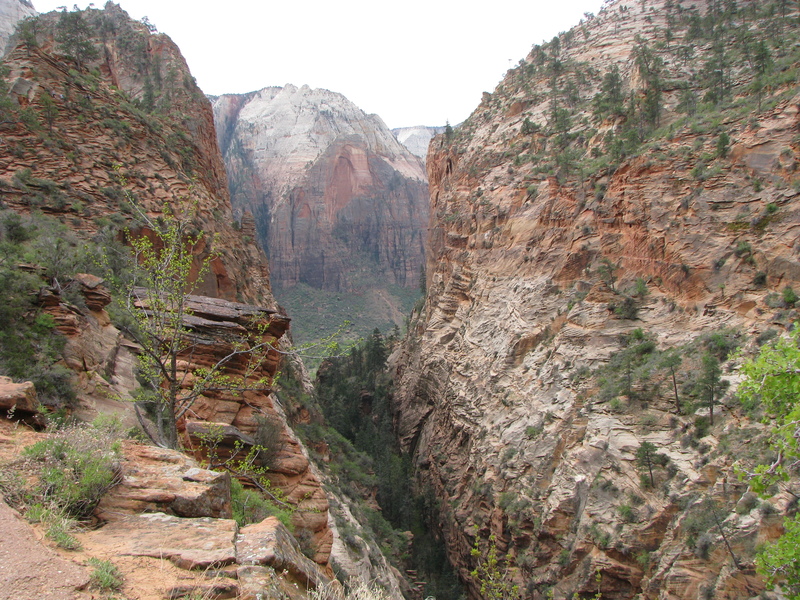 The photo is taken from the trailhead, and the “Landing” is about 2.4 miles and 1,700 vertical feet away. 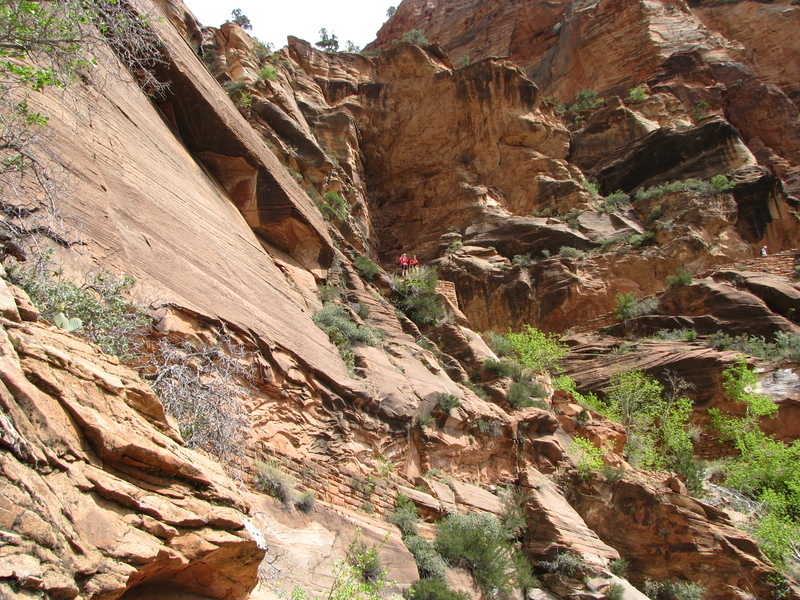 The route meanders for about a half mile along the left side of the Virgin River, then ascends up the cliff face via a series of switchbacks to the “saddle” in the middle of the photo. 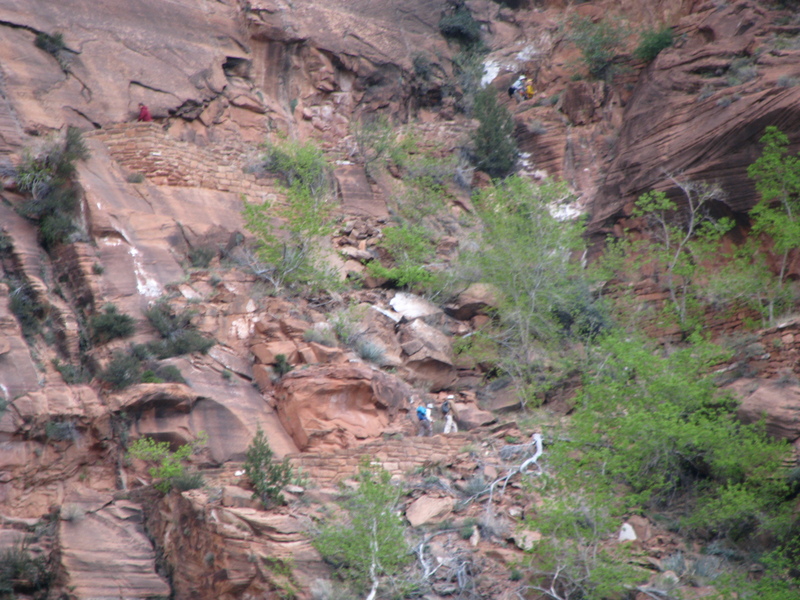 In the photos below you can pick out hikers at various stages of that vertical ascent. This portion of the hike, although a little bit challenging due to the constant exposure to looooong drop-offs, turns out to be quite easy. 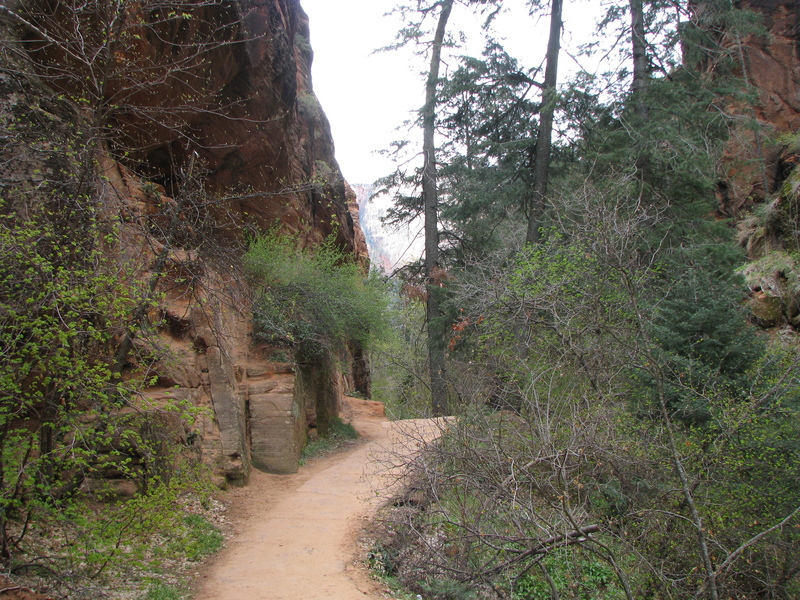 The trail surface is smooth and wide, and in excellent condition, and the switchback inclines are gentle. 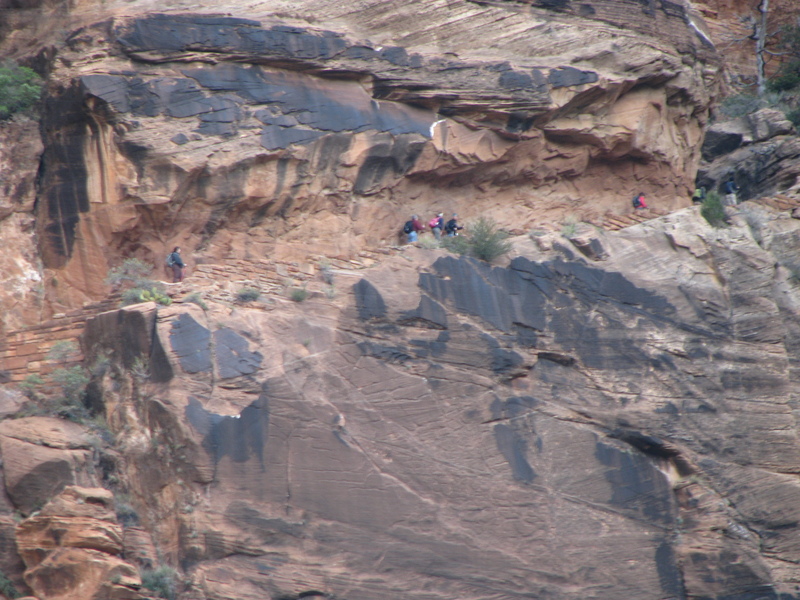 Soon you find yourself ignoring the fact that you’re essentially working your way up a 800 foot vertical cliff, and you start taking in the awesome views of the canyon scenes being revealed below you. Yes, that’s a double-length bus on a two-lane highway you see far below! The trailhead is just around that bend in the road behind the bus. Finally we’re approaching the level of the saddle you saw in the first photo. Note the hikers above me, almost dead-center in the photo below. 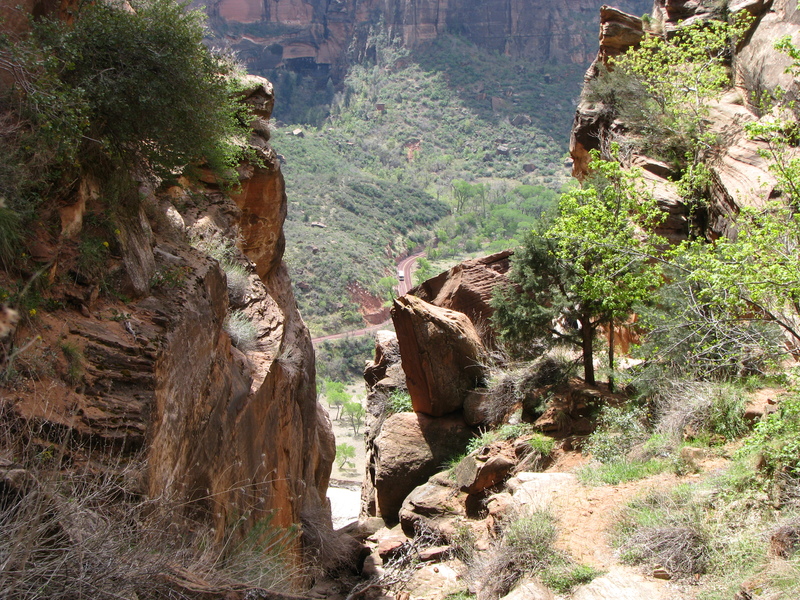 When you gain the saddle, you actually find yourself in a hanging canyon, with great vegetation, and even more important a narrow passage with high sides shading you from the sun. 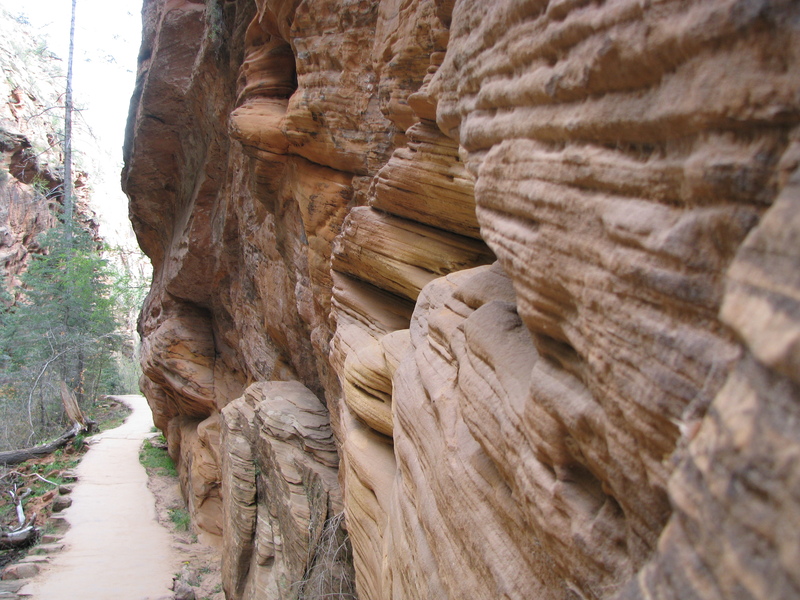 This gorge runs pretty flat for about a third of a mile, and (because of the coolness) is nicknamed “Refrigerator Canyon”. 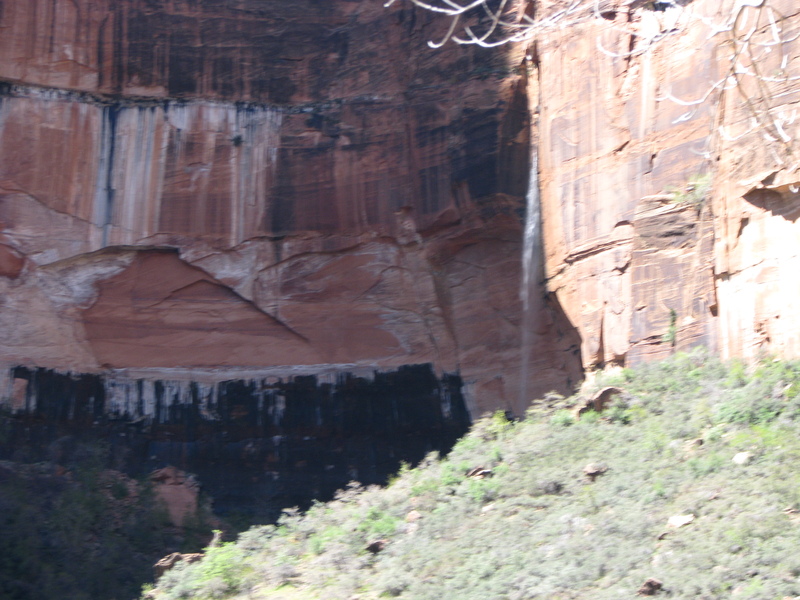 Over the ages the canyon walls have been eroded into strange an beautiful patterns and textures. 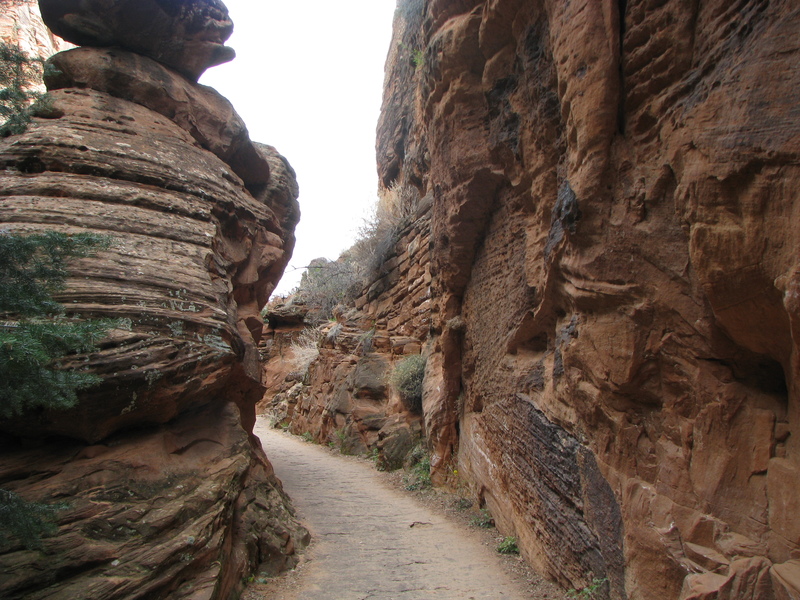 After you get comfortable with this easy hiking you suddenly find yourself in another vertical ascent, this time a series of about 35 or so quick switchbacks up a “chimney” at the head of the canyon. 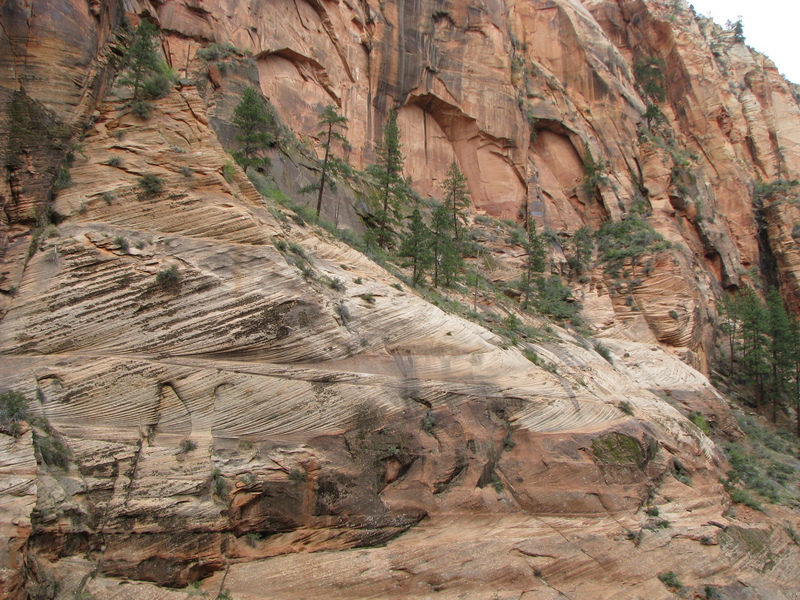 This segment, named “Wally’s Wiggles” after the early park manager who designed them, pulls you up about 250-300 feet to the Zion Canyon rim. 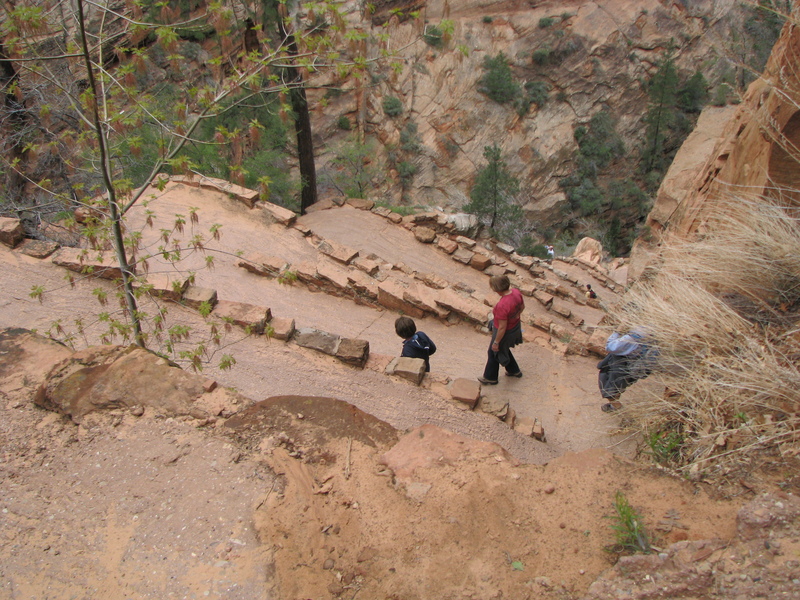 Below is a view looking down from the top of the Wiggles — only a handful of the switchbacks are visible in this view. Well, OK, now you’re at some serious elevation, about 1,400 feet up. The views are breath-taking. Look at the sign above, and note the first lone pine. About 50 yards shy of that tree is where I lost my nerve and turned back. Needless to say, I wasn’t taking a lot of photos, but basically this is a narrow ridge line with sheer drops on either side. A heavy chain is your “trail”. Took the photo below early on the segment, then decided the camera work was reducing my traction by 50%, so no more pictures! This chain extends all the way to the top, but I decided that once you’ve seen a couple hundred yards of the chain, all the remaining links are going to look pretty much alike. I returned to the lookout, enjoyed my lunch, and headed back down. At the bottom of the cliff, I took a detour to the trailhead via a side trail which took me to a nice area with waterfalls and a striking array of cottonwood trees along the river. Editorial comment: Here’s a link to an old discussion about the safety of this route. Personally, I hope it remains the same. 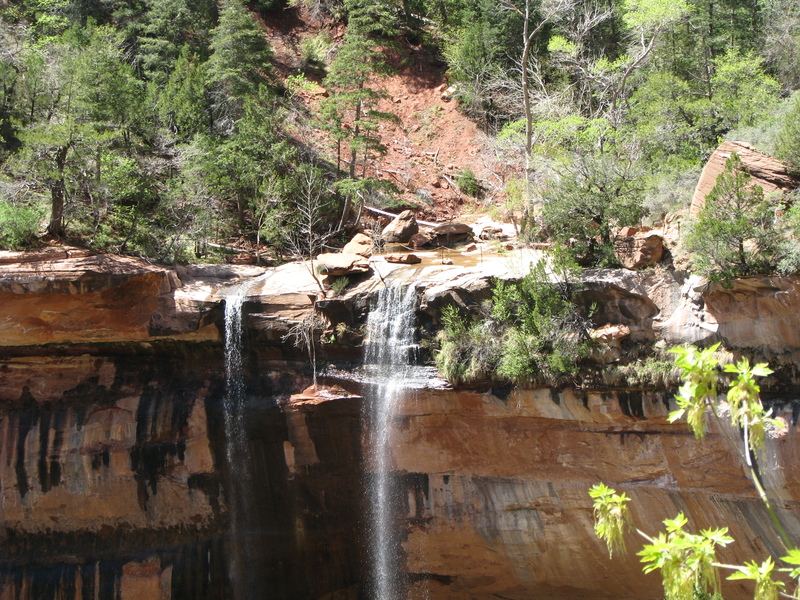 This entry was posted in Arizona hiking and tagged angels landing, National park, utah hiking, zion, zion n. Bookmark the permalink. After reading your post, I am going to look at Curt’s photos again. 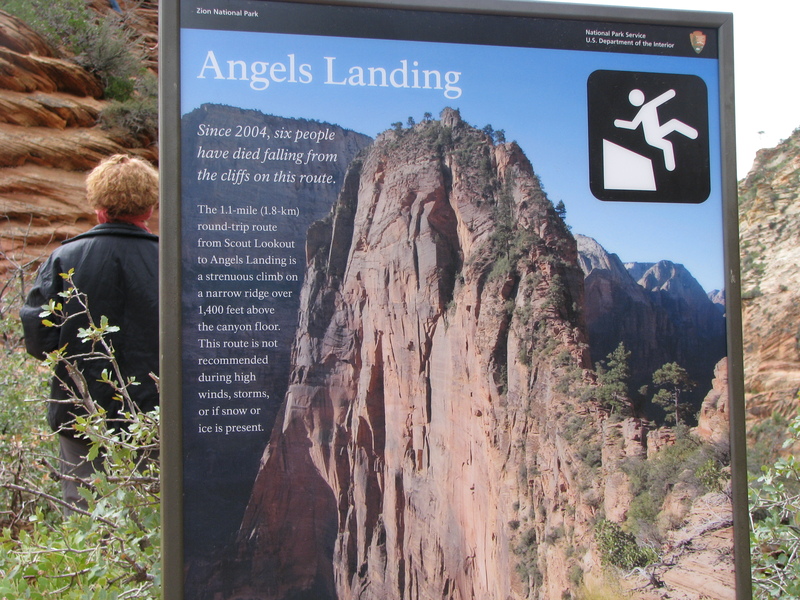 Your trip sounds more dangerous than Curt’s trip along Angel’s Landing! Thanks for the good photos and description…as usual! Curts’ hike was riskier, Coleen. He went to the end of the chain! You always get such great pictures. What camera do you use? The camera is a small Canon, model “PowerShot S5IS”. Would like to carry an SLR, but too bulky for hiking. 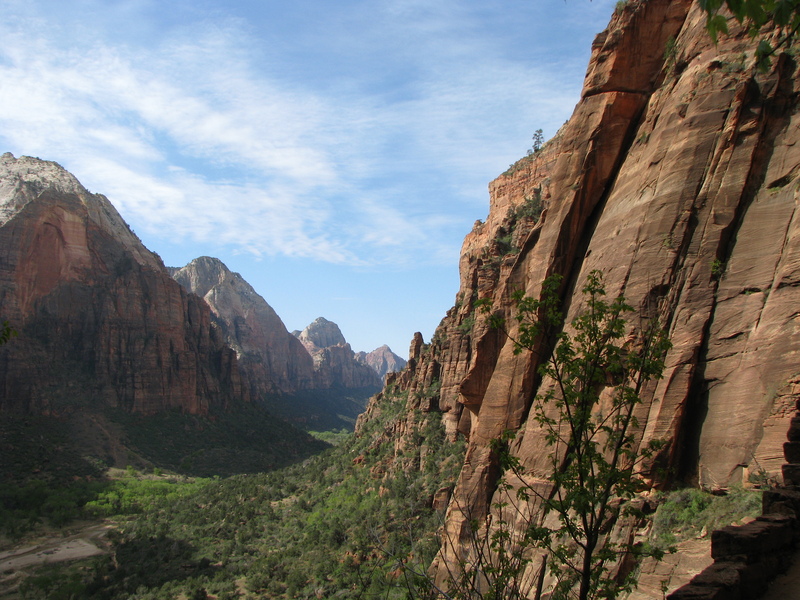 Right around the same day you guys were there Zion was on CBS Sunday Morning. Neat place! Found your blog on hitchupandgo. 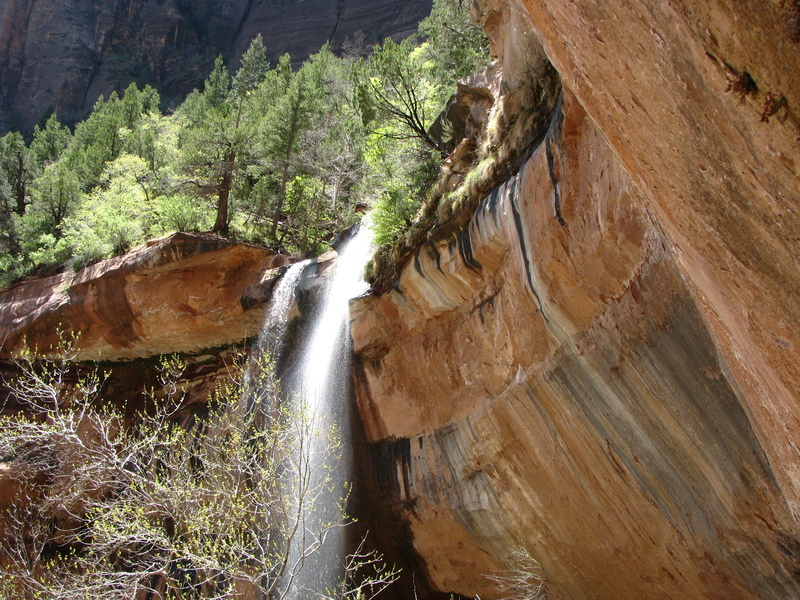 Thanks for the terrific narration and photos of your hikes. Great info! 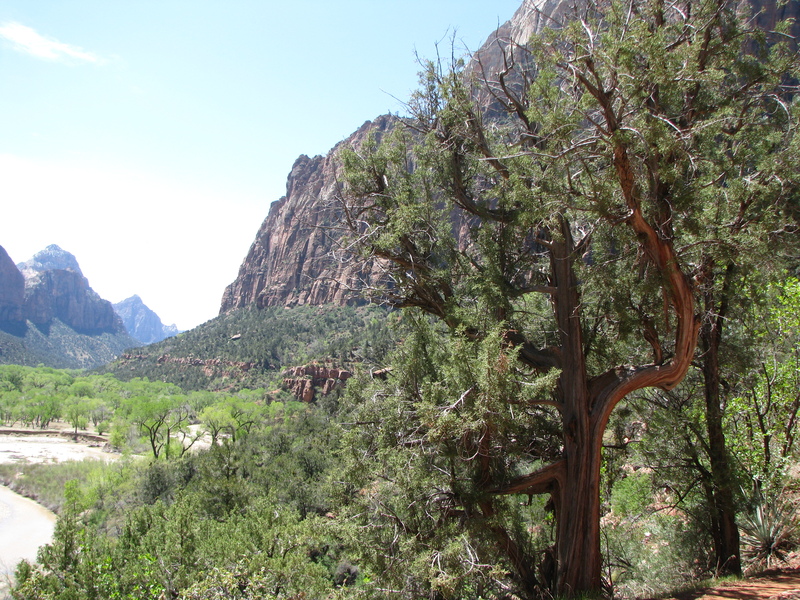 And I turned around at that same tree on Angel’s Landing. It’s on my bucket list tho, someday i’ll do that chain to the top. Mary, if you go to the end of the chain you’re a better man than I am. I’ve checked this one off my list as “done”. 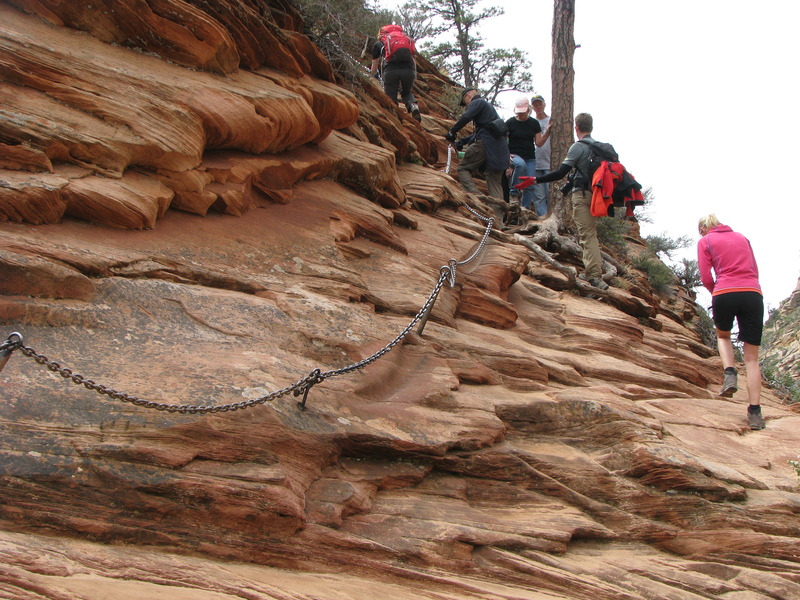 I figure that chain looks about the same all the way to the end, and as it was the only place I dared look…….